Marche , or the Marches, is one of the 20 regions of Italy. The name of the region derives from the plural name of marca, originally referring to the medieval March of Ancona and nearby marches of Camerino and Fermo. The region is located in the Central area of the country, bordered by Emilia-Romagna and the republic of San Marino to the north, Tuscany to the north-west, Umbria to the west, Abruzzo and Lazio to the south and the Adriatic Sea to the east. Except for river valleys and the often very narrow coastal strip, the land is hilly. A railway from Bologna to Brindisi, built in the 19th century, runs along the coast of the entire territory. Inland, the mountainous nature of the region, even today, allows relatively little travel north and south, except by twisting roads over the passes. Marche extends over an area of 9,694 square kilometres (3,743 sq mi) of the central Adriatic slope between Emilia-Romagna to the north, Tuscany and Umbria to the west, and Lazio and Abruzzo to the south, the entire eastern boundary being formed by the Adriatic. Most of the region is mountainous or hilly, the main features being the Apennine chain along the internal boundary and an extensive system of hills descending towards the Adriatic. With the sole exception of Monte Vettore, 2,476 metres (8,123 ft) high, the mountains do not exceed 2,400 metres (7,900 ft). The hilly area covers two-thirds of the region and is interrupted by wide gullies with numerous – albeit short – rivers and by alluvial plains perpendicular to the principal chain. The parallel mountain chains contain deep river gorges, the best known being those of the Furlo, the Rossa and the Frasassi. The coastal area is 173 kilometres (107 mi) long and is relatively flat and straight except for the hilly area between Gabicce and Pesaro in the north, and the eastern slopes of Monte Conero near Ancona. Marche was known in ancient times as the Picenum territory. In the fourth century BC the northern area was occupied by the Senones, a tribe of Gauls. 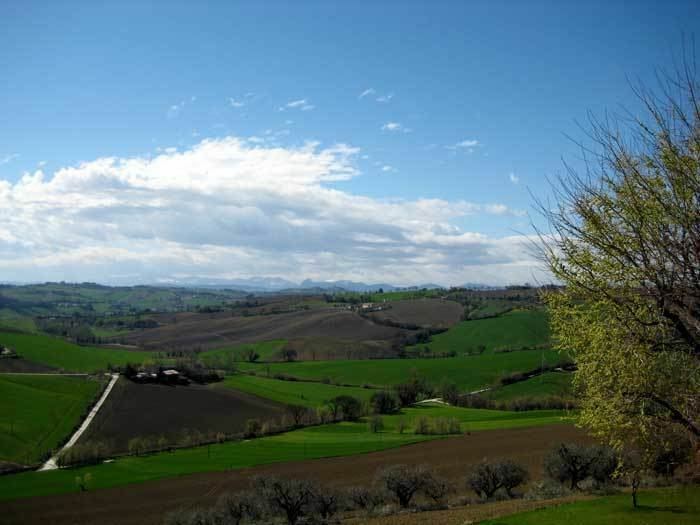 In Marche was fought the Battle of Sentinum in 295 BC; after it, the Romans founded numerous colonies in the areas, connecting them to Rome by the Via Flaminia and the Via Salaria. Ascoli was a seat of Italic resistance during the Social War (91–88 BC). After the fall of the Western Roman Empire, the region was invaded by the Goths. After the Gothic War, it was part of the Byzantine Exarchate of Ravenna (Ancona, Fano, Pesaro, Rimini, and Senigallia forming the so-called Pentapolis). After the fall of the Exarchate it was briefly in the possession of the Lombards, but was conquered by Charlemagne in the late eighth century. In the ninth to eleventh centuries the marches of Camerino, Fermo and Ancona were created, hence the modern name. Marche was nominally part of the Papal States, but most of the territory was under local lords, while the major cities ruled themselves as free communes. In the twelfth century, the commune of Ancona resisted both the imperial authority of Frederick Barbarossa and the Republic of Venice, and was a maritime republic on its own. An attempt to restore Papal suzerainty by Gil de Albornoz in the fourteenth century was short-lived. During the Renaissance, the region was fought over by rival aristocratic families, such as the Malatesta of Rimini, Pesaro, Fano and the house of Montefeltro of Urbino. The last independent entity, the Duchy of Urbino, was dissolved in 1631, and from then on, Marche was firmly part of the Papal States except during the Napoleonic period. This saw the short lived Republic of Ancona, in 1797–98, the merging of the region with the Roman Republic, in 1798–99 and with the Kingdom of Italy from 1808 to 1813, and the short occupation by Joachim Murat in 1815. After Napoleons defeat, Marche returned to Papal rule until 4 November 1860, when it was annexed to the unified Kingdom of Italy by a plebiscite. After the referendum of 2006, 7 municipalities of Montefeltro were detached from the Province of Pesaro and Urbino to join the one of Rimini (Emilia-Romagna) on 15 August 2009. The municipalities are Casteldelci, Maiolo, Novafeltria, Pennabilli, San Leo, SantAgata Feltria and Talamello. Prior to the 1980s, Marche was considered a rather poor region, although economically stable in some sectors, thanks particularly to its agricultural output and to the contribution of traditional crafts.